What's wrong with this screen grab shot? 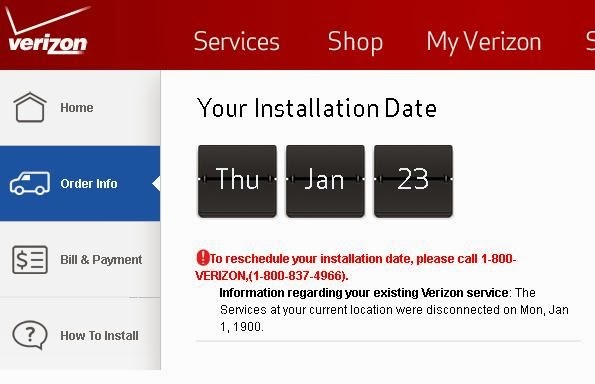 Here's a screen grab from my Verizon account. Notice something a little...odd? There’s an odd similarity between the earliest story told about the great-grandmother I’m named after and the earliest story my parents used to tell about me: both involve an open window and a fall. I’ve already told you about my mother’s earliest memory, how her grandmother held her hand and ran home with her from a pogrom in Jerusalem. I don’t know what my grandmother’s earliest memory or story was, although I do know several fascinating tales from her childhood and teen years that I plan to tell you in another post. The earliest story told about my great-grandmother, however, is so remarkable that it became a part of our family’s legacy. 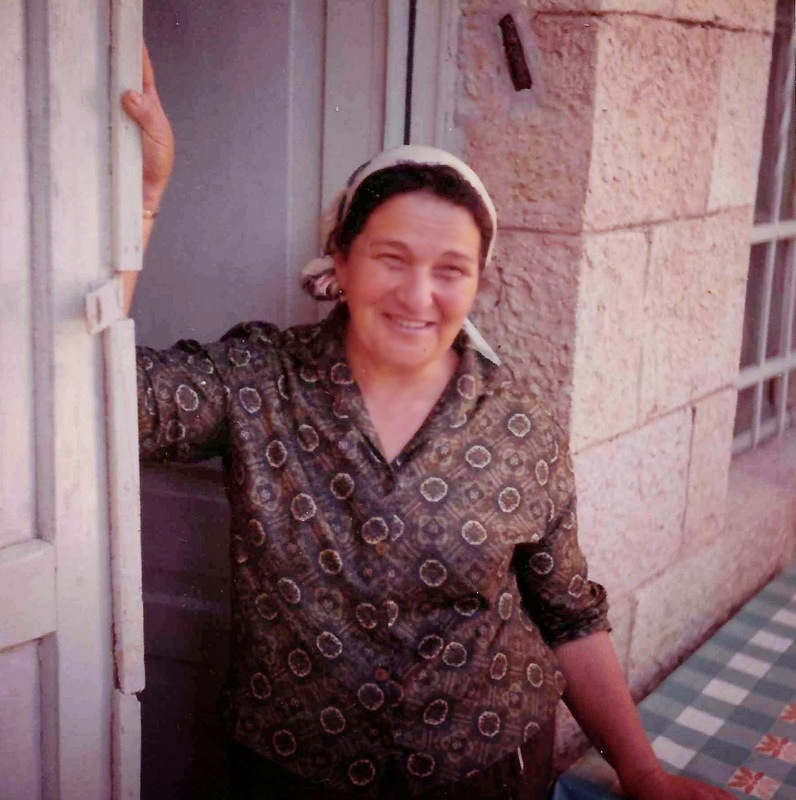 My great-grandmother was named Bat-Sheva, a name that has been passed down in our family going all the way back to the biblical Queen Bat-Sheva, my royal ancestor and original namesake, the wife of King David and the mother of King Solomon. My great-grandmother was born in Poland sometime in the 1870s. At the time of this story she was still a toddler, only two or three years old. Her father was a rabbi who also edited a newspaper, making him the first newspaper writer of five generations of newspaper writers in my family, ending with me (unless, somehow, my daughter carries on that legacy or marries a journalist). I don’t know much about where they specifically lived, although I do know it was in a building that was at least three-stories high, so I have to guess it was a city. I know it was three-stories high, because that’s an important part of the story. One day when my great-grandmother was just two or three years old, she climbed up to an open window on the third floor and fell out. He saw his precious little daughter fall out of that third-story window, and there was nothing he could do to stop it. She was just a baby, and it was such a great fall. How could she possibly survive? He had to get down to her as quickly as possible, and he couldn’t waste a second running to the window. Instead, he ran out of the room and raced down the stairs. He could hear his feet pounding with each step he took. He could hear his heart beating hard and fast with fear in his chest. But he couldn’t hear his daughter. She wasn’t screaming, wasn’t crying. His precious little girl had fallen out of a third-story window, and she hadn’t made a sound. Why hadn’t she cried out? Why wasn’t she crying now? Why didn’t she answer him? His mind, of course, came to the only logical conclusion. She wasn’t crying because the fall had knocked her unconscious. Or worse. It had killed her. He prayed to God that he was wrong. He raced as quickly as he could to the ground beneath the open window. And he could not believe his eyes. There was his precious little girl, standing up, not a hair out of place, looking as if nothing at all had happened to her. He scooped her up in his shaking hands. “Zayde carried me down the stairs,” she replied, as if it was nothing out of the ordinary. But it was out of the ordinary. In fact, it was impossible. Not only were there no stairs out of the window, but his daughter’s Zayde, her grandfather, had died two weeks earlier. Her father was so astounded by this miracle, he had the story printed up in Yiddish, and he posted notices about it everywhere he could. I once saw a photo of that notice, and I would publish it here if I could find a copy of that photo. You might wonder if I believe this story. I can’t say that I do, but I do believe that my great-great-grandfather believed it with all his heart, so I don’t disbelieve it either. Like with most things that can’t be proven, I try to keep an open mind. When I wrote Rideof Your Life—a novel about teenage ghosts falling in love in an amusement park—I treated it as a fantasy. However, as I do with all my novels, I still wanted it to make the most sense that it possibly could. It seems to me that if ghosts do exist, they must be like the people they were when they were still alive. My great-grandmother’s Zayde was a good man who would have saved his granddaughter if he could. Perhaps he did. I don’t know. I suppose it’s comforting to think he did, and that comforting feeling is something I tried to convey in Ride of Your Life. The afterlife is unknown, but that doesn’t mean it’s scary. As I said, the earliest story my mother used to tell about me also involves a fall and an open window. Unlike my great-grandmother Bat-Sheva’s tale, however, there’s nothing even remotely miraculous or other-worldly about it. In fact, it’s kind of funny, which I guess is fitting. It is, after all, about me. A few weeks before I was born, my parents flew to Israel with my sister, Eliedaat. My mother lied to get on the plane, because it was against the rules for a woman to fly in the ninth month of pregnancy. They went to visit my extended family, particularly my mother’s parents and siblings. My parents agreed. My sister, who was eleven months old, was a natural born sitter. A natural born stay-in-placer. If you wanted to find a baby to pose for an oil painting, this was your girl! She could sit for hours and hours and not move. Understandably, this led to a false sense of security. The oldest of my four younger brothers, me, and my sister. I have a dead tooth in this photo. If you guessed I got it from a fall, you'd be right. We were playing a "let's see how far we can jump" game (my sister's idea), and it turns out it wasn't quite as far as the top of the shelves after my sister had moved them the second time. The dead tooth eventually fell out, but I still have the huge scar on my right arm from when my sister decided we should play milkman with glass milk bottles. (She says we were bowling, but I'm pretty sure we were playing milkman.) It was also her idea to play doctor with cold medicine that she spooned out to us. There is a slight possibility she wanted to be an only child. I was born days after my parents and sister returned from Israel, two weeks and two days before my sister’s first birthday. On the day I was brought home from the hospital, my father took me upstairs to the only bedroom in the house they were renting and laid me down on a bed. It was a hot summer day, and the window was open. I was not my sister. He left the room, I’m guessing to check on my mom and my sister. And when he came back, I was nowhere to be seen. And the window was open. Now, I know this doesn’t make any sense. I can’t even imagine a scenario where this might make sense. But for some reason the way my father tells this story is that he thought I had fallen out of the window. I guess when you’re confronted with the realization that your assumption about your newborn being unable to move turns out to be false, you start to question the exact degree to which it is false. If your newborn can, in fact, move, who’s to say she can’t also climb windowsills? Or jump out of windowsills? Or fly? Or perhaps he knew the story about my namesake falling out of a window, and his mind played the most bizarre version of “connect the dots” anyone’s mind has ever played. Of course, I hadn’t fallen out the window. There was no miracle, ghost, or magic involved. I hadn’t disappeared. A short while later, my loud screams made it clear that I had merely fallen off the bed and had jammed between the bed and the wall. To my father, though, this was almost as astounding as it would have been if I had disappeared. Here was a newborn who could move a heck of a lot more than his almost one-year-old daughter. I couldn’t just move a little. I could move a couple feet right off of a bed. And I was only a few days old. Over the coming months, my ability to move astounded both my parents over and over. You would think they’d have learned their lesson after that first time, but no. They didn’t. One of the funniest stories my mother used to tell about me is how when I was a few months old, she put me in one of those baby carrier seats on a counter in a store. She left me alone for a second, just a second. Next thing she knew, I was crying, because I had flipped the seat over and was crawling around on the counter with the seat strapped to my back, like I was a turtle and the seat was a turtle shell I didn’t really like. Through the years, I’ve tried to find similarities between myself and the great-grandmother I’m named after, and there are a few. I found out during my mother’s Shiva, for example, that my great-grandmother loved games. Someone told me she kept a chess set in a green plastic basket under her bed and would take it out to play chess with him when he was a little boy. But although I love games in general, I don’t like chess. I’ve also heard she loved to read and was usually found with a book in her hand. But she read mostly religious books, and I read mostly nonfiction, humor, fantasy, and science fiction. And several people have told me I’ve inherited her artistic and creative side. But I write and draw, and she expressed her artistic and creative side by sewing and crocheting, which are two things I can’t do at all. But we do share a name and stories that start with an open window and a fall. Memories are like dominoes, all in a line. One thing in the now pushes a single memory and sets it into action. That memory pushes another, which pushes another, and so on. 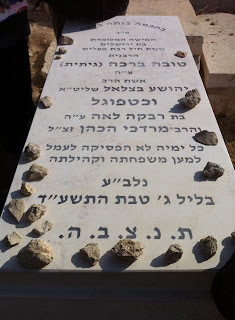 Last Sunday, my mother’s headstone was revealed, a Jewish ceremony that in Israel usually takes place 30 days after the funeral. I wasn’t there to see it, but my niece, Rinat, posted this photo on Facebook. The photo was a little push in the now. It set off a memory domino, which set off another memory domino, which reminded me of the reason why I decided I needed to write Bathsheba’s Daughters so many years ago. My mother was buried on the Mount of Olives, as were her parents. 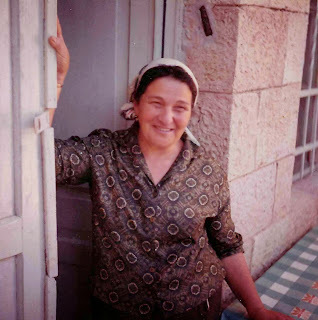 My grandmother Rivka’s father and her grandparents were also buried there, but her mother—my great-grandmother Bat-Sheva, whom I’m named after—died in 1964, when the Mount of Olives was in Jordanian hands, so she was buried somewhere else in Jerusalem. The photo set the memory of my mother’s funeral, a little over 30 days ago, into action, which set off the memory of my grandmother’s funeral, about 14 years ago. I remember sitting in the backseat of a car driving up to the Mount of Olives. My grandmother had died in her sleep in a senior home. Her health had been deteriorating, and while none of us knew that she would soon leave us, she seemed to know. She seemed to be telling us goodbye in her own subtle way. Although her body gave out, her mind remained sharp until the end, just like my mom's. It was true. 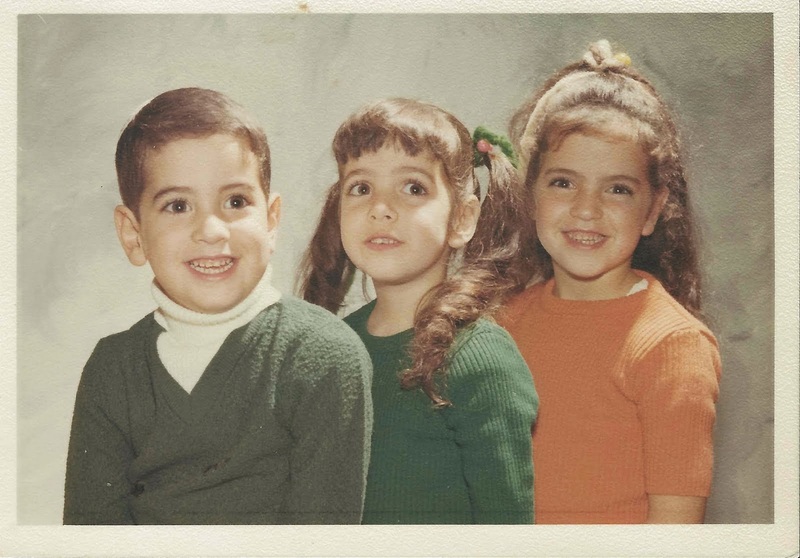 Four of us are named after my great-grandmother Bat-Sheva, and my Savtah used to call all four of us Mamaleh. Telling my cousin the reason why was her little way of telling the four of us that no one we love ever leaves us, that the great-grandmother she loved stayed with her through us, and that she would stay with us, too, in our memories and our hearts. But the final domino in that line of memories was set into action by something else. On the way up to my Savtah's funeral, I looked at the houses on the side of the road, and I saw something shocking: some of the stones in the walls of the houses had Hebrew letters chiseled into them. Someone had stolen gravestones from the Mount of Olives and had used them to build a house. And this wasn’t just one house. House after house in this little Arabic village in East Jerusalem had Jewish gravestones in their walls, each gravestone carrying the name of someone who was buried on the Mount of Olives, someone who had been loved and cared for, someone who now had an unmarked grave, because someone else wanted to erase the fact that they had ever lived at all. Many of my ancestors are buried on the Mount of Olives, but their story is different, and it’s because of my Savtah Rivka and a kind soul who never forgot a kindness done to him. The Arab riots continued until Jewish night squads, led by a British Christian officer by the name of Wingate, put a stop to them. But before they ended, some Jews who couldn't take it anymore eventually formed angry mobs determined to return blows for blows. Just like the Arabic rioters didn’t care who they attacked so long as the person was Jewish, the Jewish mobs didn’t care who they attacked so long as they were Muslim men. My grandfather was a respected rabbi who had a good relationship with his Arabic neighbors. Before every Passover, he would sell his community’s chametz (bread, crackers, and other things that aren’t kosher for Passover) to a nearby sheik; and after Passover, when he bought the chametz back, the sheik would send my mother's family a silver tray piled high with bread and rolls. One day, the Jews in the streets were in a panic. There had been another riot in Jerusalem’s Old City. Arabic cries of “Slaughter the Jews!” were being met with Hebrew cries of “Death to the Arabs!” It was a very dangerous time. Ahmad had been working that day at my grandfather’s synagogue, and he was terrified. How could he return home? The angry Jews in the streets would kill him! Ahmad seemed apprehensive. While it was true the disguise could save him from the angry Jews, what would happen once he reached his own neighborhood? How would they react to this rabbi in their midst? She went to her closet and pulled out a dress, a coat, and a woman’s head scarf. Ahmad put the clothes on and wrapped the scarf around his head and face. Disguised as a woman, he headed out into the dangerous streets, never to return. My grandparents worried about Ahmed, of course. He had worked for my grandfather for years, and they didn’t know what had happened to him. Had he made it safely home? They wanted to believe that he had, but there was no way to be certain. Several years later, the British left Palestine. The Arabic countries in the region and beyond united to drive the Jews out, but the Jews fought back. When it was over, Jerusalem was divided. My parents’ families were on the western side of the city, which was in the hands of the newly formed state of Israel, while Ahmed and the Mount of Olives were on the eastern side, which was in Jordanian hands. Between 1948-1967, robbers stole Jewish gravestones from the Mount of Olives. They used them to build houses, like the ones I had seen from the backseat of a car heading up to my grandmother’s funeral. Following the Six Day War in 1967, Jerusalem was reunited once more, and Jews could once again visit the ancient Jewish cemetery on the Mount of Olives. So my grandmother went to visit her father and her grandparents’ graves, something she couldn't do for close to 20 years. I imagine her journey was much like mine. I imagine she, too, was horrified to see those desecrated gravestones in the walls of the houses she passed on her way up. She must have wondered what she wouldn’t find once she reached the Mount of Olives. Would she be able to locate the places where her grandparents and father were buried? Or would she never know because of the workings of some heartless thief? She reached the Mount of Olives, and who should meet her there but Ahmed! They both cried tears of joy, so happy they were to find each other alive after all they had been through. But that wasn’t all . . .
“Come, Miss Rivka, come!” he said in Arabic. My Savtah was multi-lingual, so there was no need for him to struggle in another language. He ran up the hill and directed her to follow him. And amazingly he led her to her father’s gravestone. It was still there! They say the greatest mitzvah (good deed) is one performed for someone who cannot repay you. If that is true, Ahmed’s act was possibly one of the greatest mitzvahs anyone has ever performed. How could he possibly know that he would ever see my Savtah—the woman whose generosity had helped me return safely home—again? How could he possibly know that she would ever be able to visit her father and her grandparents’ gravesites again? Here he had performed this selfless act for almost 20 years with no way of knowing that anyone alive would ever benefit from it. And that is the final memory domino in that line of memory dominos: the reason why it’s still possible to find my great-great-grandparents’ and my great-grandfather’s graves on the Mount of Olives. Perhaps it shows no good deed is ever wasted. Or perhaps it shows that even if we think it will be wasted, we have to try anyway, because you never know.